Well done OChch and Byron! Thank you for all your efforts. I will next write a blog post inspired by reflection upon the collective Occupy Christchurch experience, as now expressed through Byron’s work. The aim is for this to become an informed philosophical and practical talk, to also be presented soon. We look forward to the book launch! Kia ora. Kia kaha. Ka kite ano. Te Tai Tokerau voters cast verdict on Hone Harawira’s Internet-MANA alliance, but the untold story is burying of the Alliance itself. From Kim Dotcom’s hired gun to Hone and Laila’s machine team leaders, the link was Alliance – which proved corrupt, decomposing, and landfill-bound. Manipulative ‘left’ dirty politics got the fakers nowhere – if there was a saving grace for the New Zealand left in the general elections of 2014, this is it. A chancre has been cut out of the Aotearoa body politic, with voter rejection of the Internet Party influence and the end of Alliance legacy. To whom do we refer? What nature this ‘machine’? The backbone of MANA – from a Christchurch perspective – was Unite Union, through Secretary/President of both, Gerard Hehir. From the Alliance, Hehir tried to build a command and control structure, fit for battle with all-comers, by sweeping party “Movement” democracy aside. 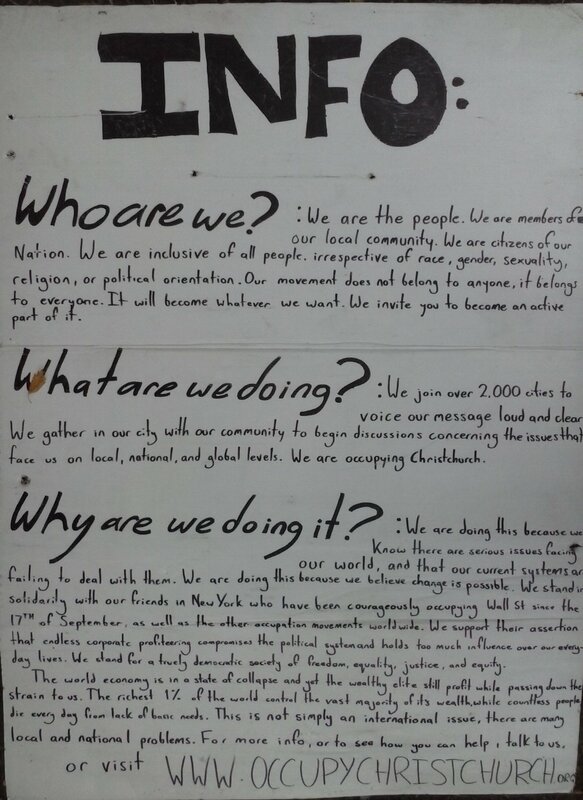 When MANA Christchurch branch set out using democracy, it was crushed to squeeze any autonomy out. 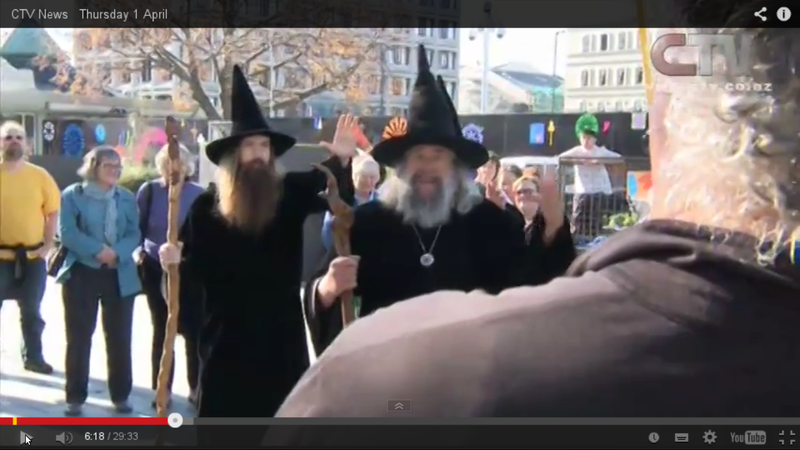 Hehir employed the new Unite organiser for Christchurch – Ben Peterson, who replaced the Unite organiser convicted for P distribution here – to see through fake-left coup in the city, in the form of MANA Otautahi. This was fascism. 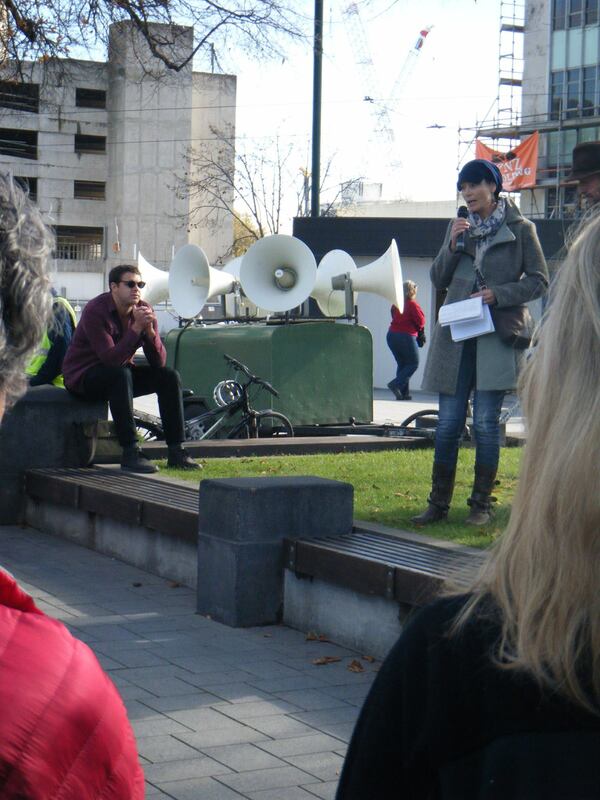 MANA Otautahi grew out of Occupy, where Fightback members had been binning votes alongside anarchists during the elections of 2011, instead of helping MANA Christchurch. Once bored of and failed in Hagley Park, Fightback turned its sights on MANA, early 2012, as next field of action. The coup started then, through Fightback leaders Kelly Pope and Byron Clark, backed by Grant Brookes in Wellington. Hehir engaged Fightback to overturn MANA Christchurch democracy, to extend inner party control. This was fascist dirty politics. Fightback and Unite reinforced old Alliance links to ensure that only their candidates had any chance of selection for Internet-MANA in 2014. This was corrupt. Alliance Secretary Anna Sutherland became Internet Party and Internet-MANA Secretary, further illustrating the monopoly and explaining why “the [Alliance] party did not nominate a list for the 2014 election, and nominated only a single electorate candidate” – to avoid competing with Internet-MANA – Alliance (New Zealand) Wikipedia. The New Zealand left cannot start to recover, to rebuild electoral integrity, until it faces and expels the misguided plotters at its core. That is too general a condition in the labour movement here, which really needs to stop. Defining fascism is that it increases the influence of capital over society, by promoting nationalism and reducing democracy, merging corporation and state. 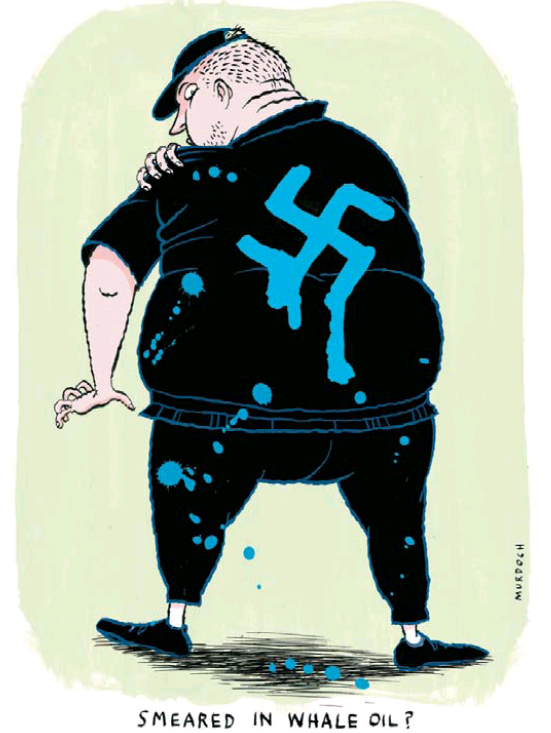 On this measure, MANA – through its capture by extreme left internal organisations – has become a fascist movement. The outcome of the New Zealand general elections of 2014 – delivering a higher level of capital dictatorship over New Zealand – confirms this fact. It comes as no surprise from overt and morally conflicted intervention of internet capital into politics; the same old dirt. The way back is out of a debris minefield. Carefully. Q: When is a political party not a political party? A: When it is the New Zealand Internet Party. The IPNZ must implement internal democratic processes quickly or be cast into the dustbin of history. IPNZ must show that it respects democracy or New Zealand voters will throw it out by September. The IPNZ leadership must be elected by the IPNZ membership, by transparent democratic process soon, or they lose what credibility they may have had: Vikram Kumar and Laila Harre can no longer represent Kim Dotcom; they are his employees and have 100% conflict of interest, as such, and are therefore unable to represent democracy at the same time. Think of the equivalent civic voices in the New Zealand Labour Party – Moira Coatsworth and Mike Williams, current and past party presidents – elected by and accountable to the NZLP membership, to run the organisation well: working for democracy, as expression of democracy, is apparent in the party structure. But the same cannot yet be said of the Internet Party, who, on the face of it, are anti-democratic therefore. Kumar fills the role of Coatsworth for the IPNZ, but as hired chief executive. This defines the Internet Party as a corporation operating in the political space, and not a ‘political party’ at all. 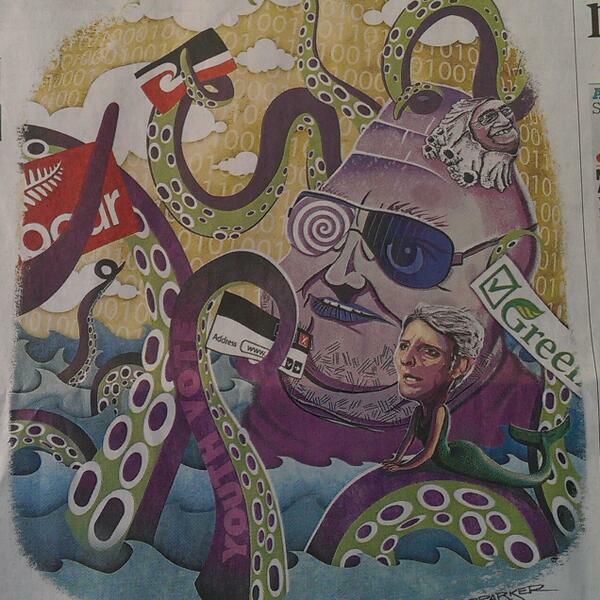 IPNZ is a political corporation, so far… and, like all corporations, is anti-democratic in getting its way. So IPNZ dangles dollars to hire representatives – of Kim Dotcom, not the New Zealand public – to push into Parliament, using multi-media advertising cash instead of traditional, on-the-ground community organising and legwork. A revolution, indeed, but not in a good way. d) in total this is a patently stupid, losing strategy, that wastes the opportunity to achieve more – strong and stable new coalition government with a 5%+ IPNZ contribution – which thus wastes everybody’s time and should stop. Internet Party viability looks like this. Bring democracy to the New Zealand Internet Party, now! On Saturday NZ needed to see political fireworks, to maintain IP momentum. The first thing we heard as Chch-IP candidate nominees was ‘We are sinking in the polls and need something to turn that around’. The candidate screening session involved many and gave us all that boost for a week. But then ‘know better’ (Alliance?) bureaucracy took over and hosed democratic impulse down, culminating in Laila’s “reveal” – a term from game show territory. So three weeks later, where are the ‘fireworks’ of IP energy, grabbing media attention? No doubt there are stories like this in every NZ city and town – actual political experience discarded for a manicured, often boring or twee TV performance by Kim Dotcom avatars. Laughing stocks propped up by minor celebrity, otherwise barely noticeable or managerially embarrassing. Full marks for gender and ethnic range though, none for the ageism. From travesty to farce.. So Laila is already deputy? This can’t sell or fly, any way you spin it. Sad. But welcome, if you make it, citizen K.
Full credit to Kim Dotcom for getting the IMP waka moving, but the sooner he hands over his rudder the better. Kim’s hirelings are building a ‘representative’ structure per instruction, but will Kiwi people endorse them? 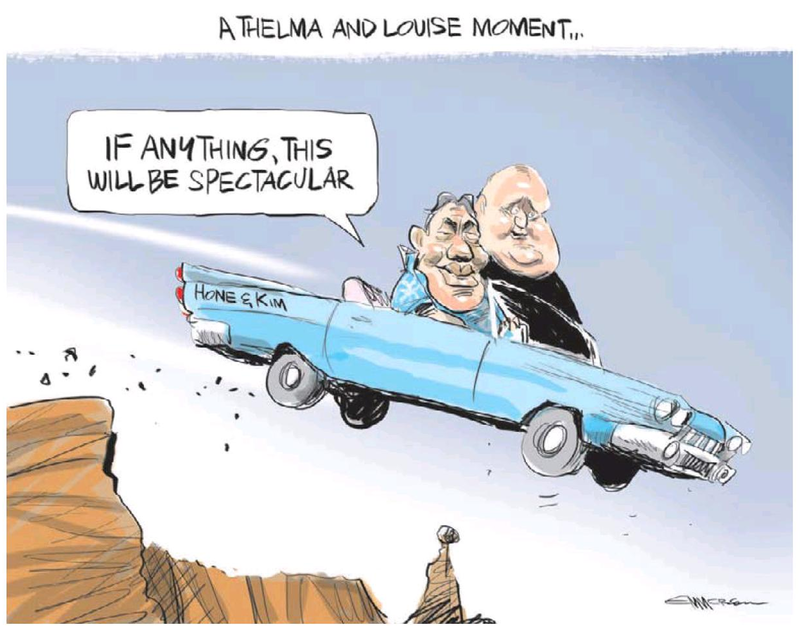 Only if democratic norms prevail – something New Zealanders understand and value a lot. Without rank-and-file input for where the Internet Party is going, it is bound to hit the rocks of reaction. So let’s stand up for what is right in representation and take the reins – should Kim be willing to pass them on. Well, I threw my hat in the ring. Had a real good look up close. Did the smell test. 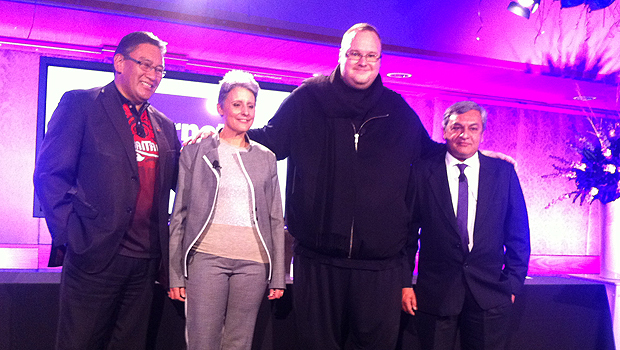 Whatever can be made of the Kim Dotcom saga, how does his political party shape up? – Not well. Limiting the number of candidates to twenty will leave a majority of electorates looking rejected, out of consideration for party votes there. So the low target will get few if any MPs in, relying on use of the coat-tail rule to drag just the Internet Party leader in, if Hone Harawira is re-elected in Te Tai Tokerau / Northland, New Zealand. Is this the minimalist goal? Inspiring more candidates to run, through more NZ-wide openings, would potentially have built a wave of support to sweep the new party past the five percent thresh-hold and into substance and credibility. Maybe even changing the government – the primary goal. A ‘political party’ with a chief executive instead of an elected chair or president? Hired by Dotcorp to find and appoint a so-called ‘leader’ instead of organising internal election? It’s like Tony Marryatt hiring Bob Parker by shoulder-tap. How could we be so stupid as to ignore such shonkyness, anti-democratic in fact? The ability to get in and change it is not there. Modelling on Key’s dictatorship by coat-tail rort does not fly. Call for Harre’s removal, and Internet Party democracy or deregistration. Distraction over. The people want justice, but every three years it eludes us. 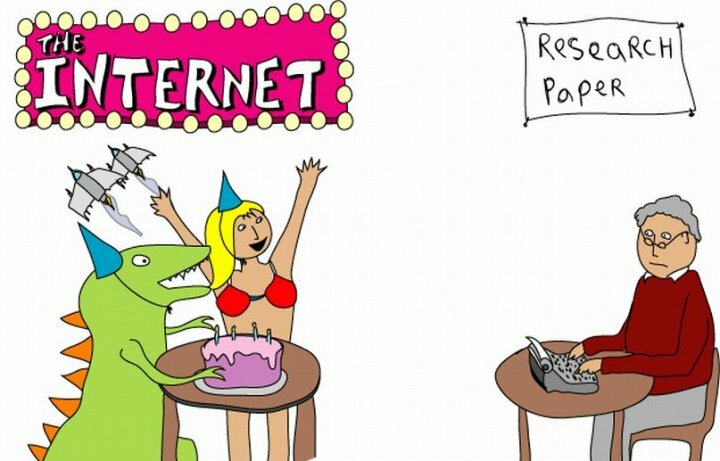 The Internet Party seems intent on repeating the mistake of the Occupy movement, whose champing ageism left it raw of ideas for continuity and swept into the gutter. The bigger picture – of The Internet – they do not get. Internet Party viability looks like this. The New Zealand ‘Labour’ and ‘Green’ parties (traditional reformist social-democrats) imitate the openly corrupt National Party (former Reform, big land/business owners) in far too many ways. The mainstream ‘Opposition’ here fail to appreciate that the alternative they offer must be completely different and devoid of corruption, and so they are strongly flavoured with the manipulative and monopolist tactics they only pretend to oppose, awaiting their inevitable turn in the big chair. The capitalist class could not recover on their own; they needed eager subordinates – the ‘softer’ fascism of professional moderators, the New Zealand Labour Party of the 1930s, 40s and today; stopping strikes, squashing radical unionism and cancelling democratic elections (as in 1942) is Labour’s repressive forte. 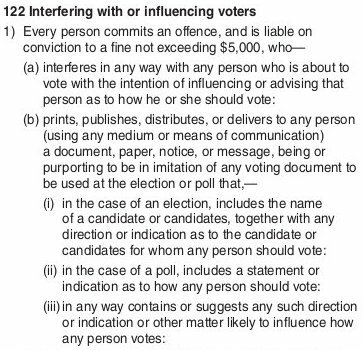 So when National cancels democratic elections for Canterbury region in 2010, Labour are just hypocrites to complain. Why do they bother? Simply to maintain corrupt hegemony over workers and the alternative left discourse is the reason; that and seeing protest as an ‘elect me’ promotional opportunity in an election year. For in Canterbury it was the rotten Labour Party, under dairyman’s daughter Helen Clark, that set the course for running Canterbury aquifers dry. National simply wanting Labour’s dairying growth to continue – through artificial water storage for increasing dryland irrigation – explains why National pushed the Labour-led Environment Canterbury (ECan) council aside: they just want Labour’s dirty work done quicker, that’s all. So when Greens connect with the fake Labour fightback, it is just as fake. 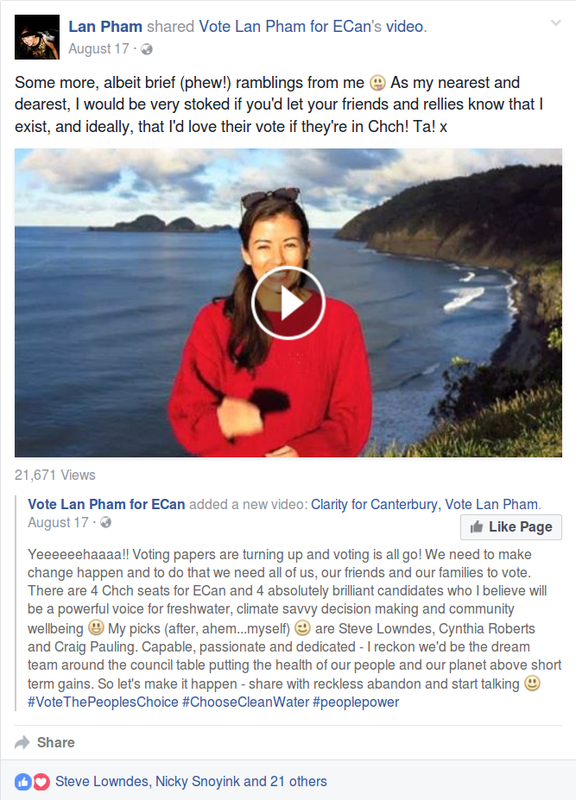 Together they built their internal corruption into an ‘Our Water Our Vote’ foil with one main intention – to capture the radical mood of resistance to water degradation from Christchurch residents, to turn it to their own careerist advantage and defuse it. The Green Party in particular sought to extinguish a successful, competitive environmental brand, no matter what cost in loyal members, for centralist conformism. 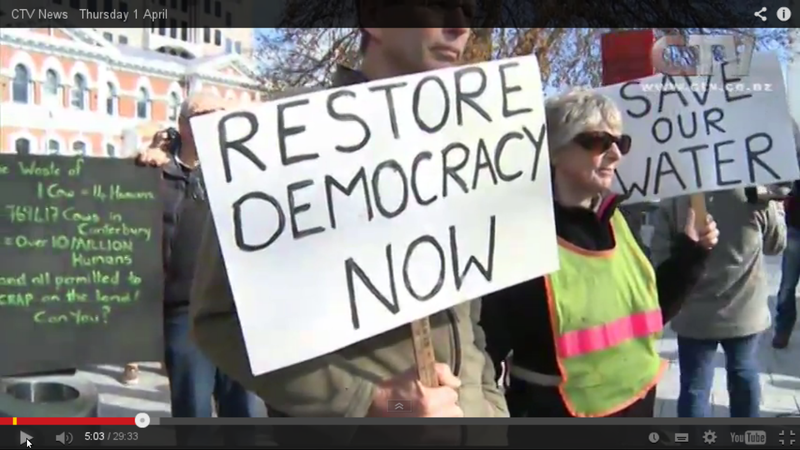 May 1st’s weak Christchurch ‘protest’ shows that the social-fascist method is really working (negatively): 100-150 protesters is what various media have estimated attended, compared with the several thousands mobilised post ECan-intervention in 2010. Our Water Our Vote sprang up immediately after the 2008 National government used Parliament to crush the successful Save Our Water (SOW) campaign of 2007, and never defended it one bit – because SOW’s appeal to honesty from agrarian representatives on council is something Labour-Green cannot stomach. Anything but honesty is Labour-Green’s method, and so they have dulled the water resistance’s radical edge; intentionally, as that is their corrupting historic role. Corporate-fascist newsmedia, of course, connive with Our Water Our Vote to filter Save Our Water out of the discourse – such is its radical potential for change. Fascist apologists like Chris Lynch attack the former elected regional council without knowing much about it – experience and relevance are thrown out the window in NewsTalkZB’s rank toadying to government. Who is pulling Lynch’s strings? After all, he is muppet master. When Lynch attacks the former council, out of plain sensationalist ignorance, he defends the theft and lies of the irrigation sector and John Key himself, in inventing cause for stealing democratic assets, exposing Chris Lynch’s personal dishonesty stock in trade. The spokesperson the journalist corporate cronies gathered around was MP Ruth Dyson – a Clark protege twinned with the city’s current mayor. 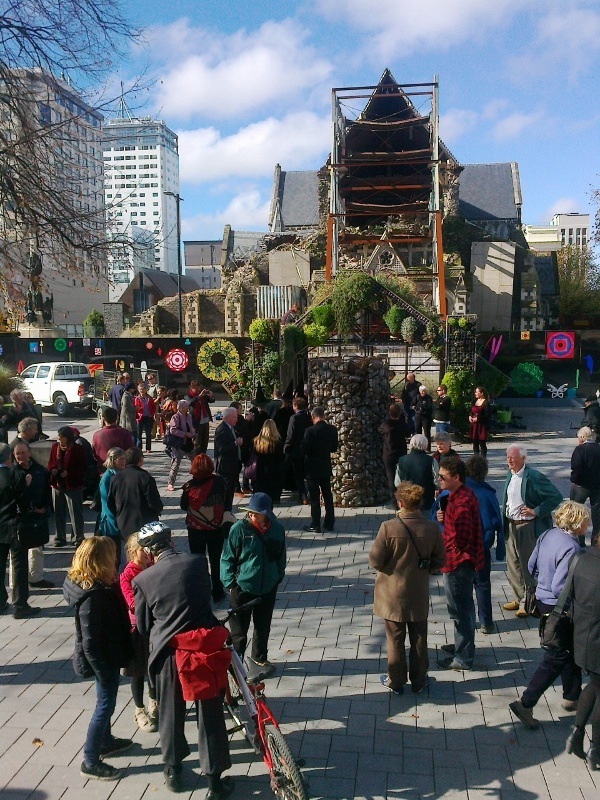 No wonder Christchurch cannot move forward, when workers’ standing is eroded and substituted this way – a false ‘environmental’ opposition by dairying’s major advocates, and a broken church symbol they are preserving forever for the ‘heritage’ cause – as pictured above – again as substitute for human welfare policies. False False False, Labour-Green alliance. It is the task of Aotearoa New Zealand voters in 2014, if they wish to see improvement in conditions, to bring down not only the corporate-fascist National Party but the social-fascist Green-Labour agglomeration as well – for their deceitful ‘conservative self-help’ is no less great. Local entertainer and social-fascist leader James Dann claimed ownership of the public water fightback in 2010 – with no knowledge of it except that it was news-worthy – determined to bury the Save Our Water drive for honesty and integrity from all politicians, that had felled two Labour ECan incumbents in Christchurch East, October 2007; at ‘his gig’ May 1st 2014, the speaking list was tightly controlled and an expression of Dann’s single-mindedness, careerism and oh-so-typical, sub-Tory personal corruption: Dann is representing Labour for Ilam electorate in 2014. 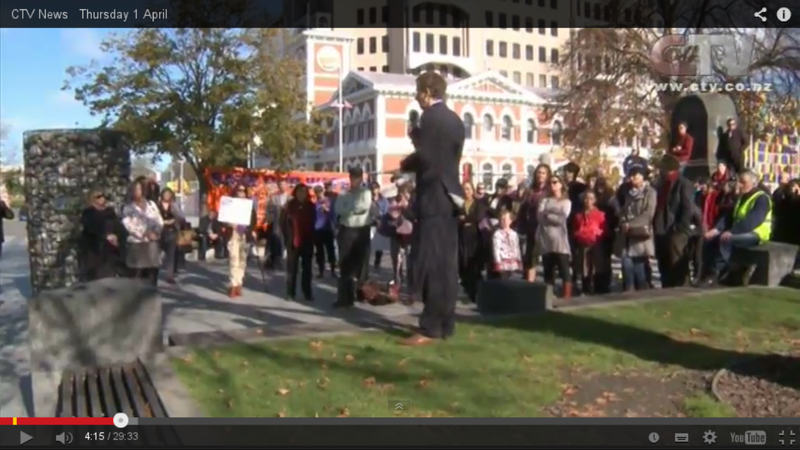 But the list of bogus leaders in the Canterbury water fightback goes on..
All from CTV News 1 May 2014: http://www.youtube.com/watch?v=sPvIWXl2q0c#t=240 ; At pseudo-left above is MP Eugenie Sage, from private school Auckland then Helen Clark’s press office, more recently a ‘Green’ MP having ridden the wave of woe into plush surroundings. Pure traitor to the SOW cause, Sage never once spoke in support of exposure of the farmer-councillor illegalities on ECan, choosing to partner with them strategically instead: complicit in crime and never to be trusted. With bend-over-backwards-for-Labour right-wing David Moorhouse – the Aoraki / Canterbury Co-convener who corruptly blocked aspiring Green candidates to favour his own political advancement – an unethical left obstruction was conceived that explains, as much as anything, why the Labour-Green empty pitch at the Treasury Benches will fail in 2014. Moral and philosophical bankrupts that they are. Social-fascism will fade before great movement for CHANGE. The corrupt, careerist and low-principled nature of the Green and Labour political machines has been revealed through Canterbury water politics. 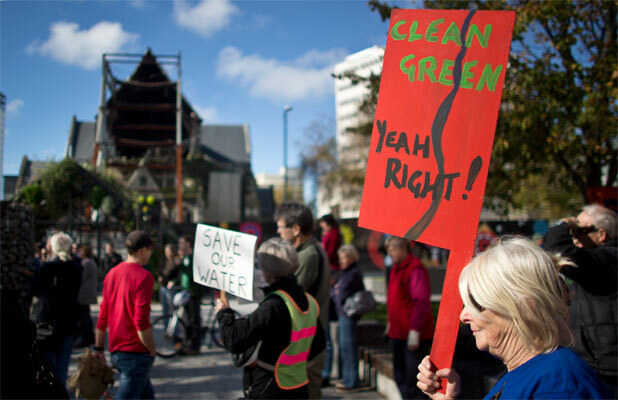 In 2007 Green members were part of the Save Our Water campaign that cut into two forms of Labour corruption on Environment Canterbury: a conflict-of-interest in the irrigation developments for one councillor and a tangata whenua iwi-corporate stranglehold, at the expense of less privileged, other-iwi Maaori and Tauiwi, in another: both were displaced electorally. Farmer-representative corruption on council using conflicted votes was then also exposed, so National sacked the whole council to hush things up and extend its crony capitalism directly as corporate fascism, in 2010. So what was Green-Labour’s response? To defend Save Our Water on principle? No. Never. Green-Labour started the Our Water Our Vote shill campaign (emphasising their job opportunities rather than environmental water quality and quantity) in competition, and won’t breathe a word about Save Our Water again. Why? To continue their own corrupt schemes, as adjuncts to National’s, as client social-fascists – the poor and begging cousins of the corporate fascism they will not name and challenge at all (extending the fascist expulsion of Save Our Water). None of these national political formations are part of a just, equitable and sustainable future at all, it has been shown. wikipedia.org/wiki/New_Zealand_Reform_Party; Judith Collins and Maurice Williamson are the names most recently associated with inappropriate and slack actions by National government ministers, leading to sackings. The rest were Richard Worth, Phil Heatley, Pansy Wong, Nick Smith, John Banks, Peter Dunne, Kate Wilkinson and Aaron Gilmore: never forget their rorting venality! On February 22nd, let us remember the 185 lives lost in Christchurch, to the Port Hills fault magnitude 6.3 earthquake of 2011. Spare a thought for the affected parties, those left to deal with close tragedy – unnecessarily. For the Port Hills quake was entirely predictable, a strong aftershock result of the September 4th magnitude 7.1 of 2010 – less than six months earlier. Causing injuries but not fatalities, the 7.1 was the wake-up call that cruel, selfish and ignorant authorities failed to heed. A threatened city was left undefended, without preparation, to the flippant “she’ll be right” attitude of leaders whose scorn for citizen life cost some, and injuries, on an unprecedented scale here. These misleaders’ SHAME is not enough. New Zealand Prime Minister John Key, and Christchurch Mayor Bob Parker, did nothing to alleviate the very obvious risk after September 4th. They never considered cordoning a compromised central city or even its damaged buildings, choosing murderous business-as-usual instead. They had let their greed and ambition guide their joint destruction of regional science and civil defence under public democratic control at Environment Canterbury (ECan) earlier in 2010. For that dreadful crime they will be forever damned. But the $$-eyed media disguise this indisputable truth, continuing the lie they cultivated from 22 February, that these disablers of adequate civil preparation were potent heroes of the emergency response. This they were not, because privatising water had pushed aside every other driver and sound practise at the Canterbury regional council, at regional CDEM,* at their behest. SHAME on Parker and Key! Do not let them away with it, these false posers-for-the-fawning-cameras, these decapitators of able civil defence. Parker’s fate as Mayor-of-mugging will be decided by Christchurch, in the local elections of October this year. Let justice ring true! But Parker’s commander, his stocky General, must pay the higher price – for the lives of innocents he has too casually lost. John Key’s reported fortune is fifty million dollars. Divided by the 185 deceased estates, that is $270,270.27 John Key can afford to pay to each – as compensation for sacrifice of their loved one’s safety to mammon, the dairy-farm expansion god that Key had ECan place before all else. And pay the moral price he must. Knighting of their main accomplice in the corporate seizure and deadly civil disabling of ECan – Ngai Tahu chief Mark Solomon – can only fail as smokescreen of their collective crime, their collective blind greed for more unsustainable pasture irrigation and devastation. I have documented the closing Civil Defence failure, that saw NZDF army absence leave trapped Canterbury Television (CTV) building survivors to die horribly, here: CTV inquest. 214 dead. EQNZ, Pike River, Christchurch. 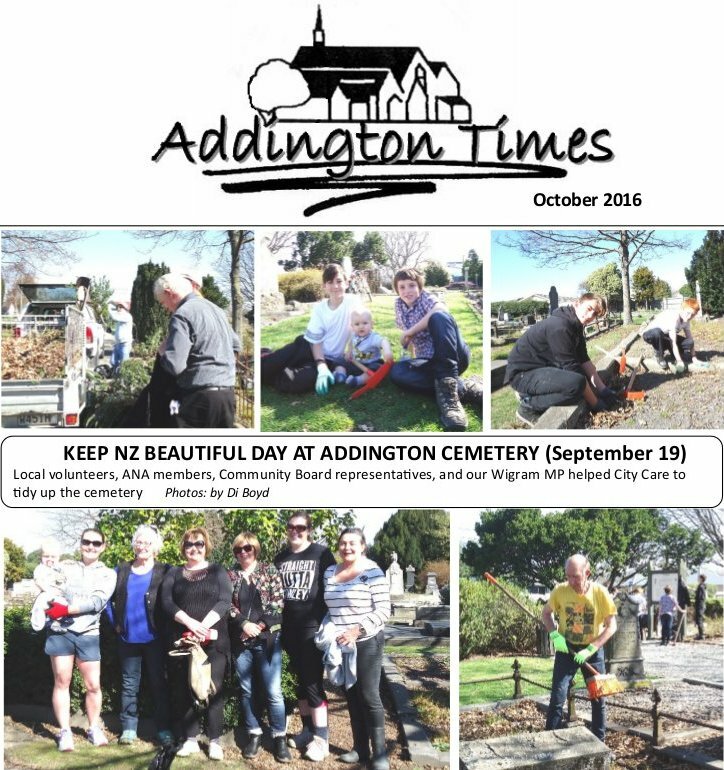 On 22 February 2013, for the disaster anniversary, Christchurch City Council is claiming lead role – falsely as ever – perpetuating the self-obsessed myth of what they did that day. The truth is the opposite: their managers stayed home in fear and incapacity, in the main, and it was the workers of CityCare who held the city together that day; like they do every day. Do them some justice too. Answers, and some honourable change, are needed: NZ Army to explain civil defence failure. Emergency response reviews offer learnings: media release, Christchurch City Council, 5 October 2012. Civil Defence – Home & Living – Christchurch City Council, EM newsletter #2: February 2013. Corrective Action Plan following the Review of the Civil Defence and Emergency Management Response to the 22 February 2011 Christchurch Earthquake (PDF, 172KB) etc here.